If you have not checked out McPherson College’s “Library of the Living Dead,” a comic book guide to their Miller Library, I am assuming it’s because your library is currently under zombie attack. In which case, you really should check it out. The creators, Matt Upson, now a director of Emporia State University’s MLS program and former librarian at McPherson College, and Mike Hall, Assistant Librarian at McPherson College, have been flooded with kudos and requests for help with similar projects from librarians all over since publishing the guide online. They took a break from their hectic days and newfound celebrity to answer questions about the guide that is making librarians world-wide swoon. They share how they did it, why comic books are great teaching tools and the magic of a beard. Q. How did this idea come about? And how did you convince your supervisors to let you put the time and resources into it? Mike: The Big Idea, using a comedic spin on the zombie apocalypse to introduce students to the library, was originally conceived as a short film. Sadly, limitations scuttled that Big Idea. Since I have years of experience freelancing in the comic book industry, shifting gears from a film to a comic book was kind of a no-brainer. We probably should’ve thought of the comic book first, given my background, but we didn’t. Weird. Matt: I was the only non-student staff at the library, which made library instruction difficult. I’d bring groups of freshmen in for tours early in their first semester, so I might have 2 days full of tours. I’d also go out into the classrooms on campus and do one-shot sessions on various research topics. Even with these activities, we still had our days filled with the basic questions that come up in all libraries. How do I find a book in the catalog? What’s a database? Where are the books? Things like that. So, in an effort to provide that basic information and free up some time for us to do other work, we decided to make a resource. But since we all know that a boring handout will usually be left on the table or tossed in the trashcan, we wanted to be more creative. Mike: As for convincing people to let us do it, we didn’t really have to. The most expensive part of producing a short-run comic book is paying for the art, but because I work at the library, I drew the book for a fraction of my usual page-rate during quiet moments in the office. The colorist is a friend and frequent collaborator of mine, so he gave us a great deal on his services. There were printing costs to consider, naturally, but I knew of a P.O.D. service specializing in comics and capable of producing a superb product, so it all fell into place at a low enough price-point that we could do the whole thing out of discretionary funds. Q: Why do you think this particular medium appeals to students? And why is it a good choice for conveying information? Matt: They are bombarded with information all the time, so we had to do something unique to grab their attention. The comic portion of the resource delivers basic information in a simple manner, and then follows it up with the more in-depth tutorials that a student can refer to when completing specific tasks. I think that it works in tandem. Mike: Comics are a dynamic visual medium. Even if the reader isn’t a big comics fan, the fun, energy, and design aesthetic of the comic book page makes it appealing and effective as an instructional tool. Information conveyed in comics form seems looser and more informal, which makes students less likely to tune out while reading, and since one of our objectives is to subvert the old notion of libraries being stodgy and dull, the comic book is a great way to remind people that we run a fresh, vital learning environment. Matt: One of our primary goals was to show the students how involved we want to be in their education. We wanted to make a resource that highlighted their library and was familiar to them. We used students as models for some of the characters. We wanted to give students a sense of ownership and pride in their library. Q: So what was the process in creating this project exactly? Matt: I’ll let Mike field most of this. I had input on some visual gags and dialogue in the comic portion. I wrote up all the tutorials and Mike formatted them for the comic. I’ve told people that this is our baby, it just looks more like Mike. Mike: Once we knew we wanted to make a comic book, we just had to ask ourselves, “What do we want to produce, and what purpose will it serve?” A few brainstorming sessions produced a wish-list of key instructional moments, and some gags leapt immediately to mind. Simple as that, we were off and running: I expanded our notes into a fully-realized script, then started shooting photo references for the building and some of the people we wanted to incorporate into the comic. Drawing the comic took a while. Under normal circumstances, I could’ve produced a work of the same size in about a month, but the unusual working conditions—handing reference questions one minute, tutoring Rhetoric students the next, then rushing back to the drafting board, all while writing my thesis—slowed me down considerably. Now, I have never been the fastest cartoonist in the world, but this all added up to me drawing at nowhere near my usual pace. I began preliminary work on the book in October, started producing finished pages by November, and wrapped up the art in March. The color work was done by Dustin Evans, who is incredibly fast and incredibly talented. He turned his end of things around in just a couple of weeks. I then spent a couple of days digitally lettering the book, assembling the digital pre-press files, and submitting everything to the printer. At a normal comic book company, it takes up to a dozen people to do what just the three of us did, so be impressed. Oh, we are VERY impressed with you all! Q. Were you able to bring students or other staff into the process in creating it? Mike: I put a bunch of our student workers into the comic. Some knew in advance they were going to be included, some didn’t—Audrey McTaggart insisted on appearing twice, both as herself and as a zombie following her in-panel demise—but everyone loved getting to be a part of the project, which helped keep the enthusiasm level high over the long production time. I also featured Dr. Jonathan Frye, our natural sciences departmental chair, in a climactic role. Oddly enough, that wasn’t the first time Dr. Frye and his deadly laser pointer ended up in one of my comics. He’s a great teacher, he’s fun to draw, and he always gets a kick out of being in on the fun. Q. Who are the contest winners you refer to in the credits? Mike: Matt came up with the idea of telling our entire student body that just by “liking” the Miller Library Facebook page, they could be entered in a drawing to get zombified in the comic book…sheer brilliance on his part, in my opinion. The winners were Aspen Frey and Dale Schwartz, who appear in the foreground of the first panel of page 9. Matt: I think we added 20 new “likes” over a week. Not huge, but significant for a student population of around 600. Q. Any notable cameos to point out? Matt: Mike drew my wife and dog on the full-page panel, so that was the only thing I add to worry about. She really wanted to be in it. But Mike did a good job of including our student workers and integrating a few directly into the storyline. We decided to not name any characters since it would quickly become irrelevant after students graduate, or the librarian leaves… which I just did. SO, hopefully, the next librarian can just pick up the resource and run with it. Mike: Most of the faces in the book are imaginary characters, though. Some of the characters first appeared in “EduMACated,” the comic strip I used to draw for the McPherson College Spectator, while others just sprang to mind when the need for a visually interesting character arose. Q. How has it been distributed on campus? Mike: The actual books won’t arrive from the printer until late April, but we made the book available as an online PDF right away, letting the whole student body know via campus email, the college website, and the library Facebook page. We also generated a scan code for smart phones, so students with smart phones can scan the code and open the comic right there on their phones! Matt: The idea was to provide them to new students and maybe even use it as a recruiting tool. Q. Any feedback from users? What was the administrative response? Matt: We just presented at the Kansas Library Association (KLA) conference and had about 60 people join our session. Librarians from all over the globe have contacted us wanting to purchase copies. We’re working on a list and are happy to take down contact information for when we can sell copies. The administration was initially a bit apprehensive, I think, but jumped on when they saw how quickly it took off. We’ve only had one really negative response from outside the college, so I’m fine with that percentage. Mike: User feedback has been almost unanimously positive. Administration seems pleased that the library has garnered as much attention as we have for having spent so little money. As far as we know, we’re the first college library to have done this, and as such administration seems to appreciate the innovation. Q. What were the major challenges and how did you deal with them? Conversely, what was surprisingly easy about the process? Matt: It was all relatively easy from my standpoint. Mike had the tougher job. I just provided input and wrote up the library instructional portions. Mike spent the hours taking pictures and doing the illustrations outside his normal workday. I just had fun coming in every morning to see what he had left for me to look at. Always a nice surprise, especially when I saw myself with a flamethrower in the stairwell. Badass. Mike: The biggest challenge was capturing some of the library’s unique architecture on the page. I really wanted the in-panel library to look like the real thing, which meant using a lot of photo reference and painstakingly transferring that information to the page. Our central stairway took me two weeks to draw to my satisfaction, but even now, if I compare the page to the reference photo, I see things I would like to fix. Apart from accurately representing the building and juggling a full schedule of work, thesis work, and freelancing gigs (I did a few of those during the production window, too), there were no other major challenges. I can’t take credit for that, though. The student staff was as supportive as could be, and they covered an assortment of tasks to buy me more time at the drawing board (special thanks to Audrey, Emily, Stephanie, Torey, and Kyle, who carried me on their capable shoulders more than once). Q. Any future plans for similar projects? Mike: We gave a presentation on the creation of the comic at this year’s KLA conference, and immediately other libraries started approaching me about creating similar products for them. We will see what comes of it. I have a number of freelance gigs to wrap up first, and I still haven’t finished that pesky thesis, but I am game. Give me something to draw other than zombies, though. Please. Matt: I am now a director for Emporia State University’s MLS program and hope to see Mike as a student this fall. I know he already has offers from other Kansas librarians to do work like this for them. He’s a great artist, writer, and he knows his way around a library, so he really understood how the content needed to be handled. Q. So, what’s with the beards? Matt: Beards just give men something to light on fire when charging their enemies. 98% intimidation, 2% food storage. 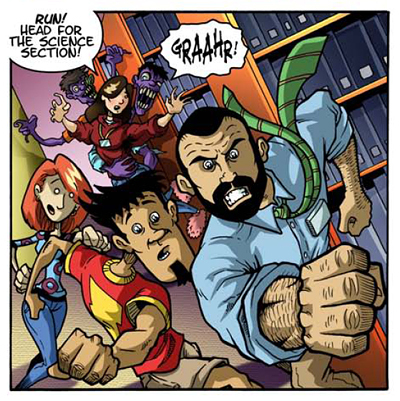 Mike: Oh, that’s obvious: the beard is the repository of magical zombie-fighting-librarian-power! I don’t know where female librarians store their magical zombie-fighting-librarian-power, but I haven’t finished my MLS yet…I imagine that’s something they’ll tell me on the last day of grad school, but only after swearing to me to secrecy. My hypothesis: that’s where the infamous “librarian hair-bun” comes into play. Want more information, care to refute the librarian bun theory or just want to give them virtual high-fives? You can email Matt (librarian, writer) and Mike (upcoming librarian, art guy) at: matthewupson@gmail.com and cmichaelhall@cox.net. When will the LC version come out? LOL!! 1) To show the students how involved you want to be in their education. QUESTION: Do students care about what you want? Consumers of all kinds (yes, even student consumers of library resources) typically care overwhelmingly about what they want. QUESTION: Did you, in fact, convince them of such care, and how do you know? 2) To make a resource that highlighted their library and was familiar to them. QUESTION: Did you succeed in this goal, and if so, do you know this on the basis of valid assessment with your target audience? 3) To give students a sense of ownership and pride in their library. QUESTION: Did you succeed in this goal, and if so, do you know this on the basis of valid assessment with your target audience? I really appreciate this remark. I am working on ways to assess what I do. First up is a giant community survey for those events. Next up are more focused means of assessing particular programs. A formal assessment of the comic will be tough to do because #1) I have taken a different position and #2) because Miller Library is run by only one non-student staff member. I’d like to believe that was because we showed the students how relevant and fun the library could be. Formal assessments are nice, but we didn’t have the manpower or time to do something like that. I just did my best to ask questions, pay attention to the students, and move quickly on issues that I noticed. If the students were drifting off when I was leading instruction, I didn’t need to have them fill out a survey, I just changed my tactics until something worked. When we told the students that the comic had over a million hits online, their eyes went wide. I have to believe that some sense of pride comes out of that. So, we don’t have hard data to prove that we succeeded at pulling the students in with the comic, but it feels like it will help. And sure, I can’t cite my feelings as evidence for anything, but the attitude on the campus shifted, even before this comic, which was essentially a culmination of our efforts to make students comfortable with the library. The numbers were up, more and more students were using the library, so we kept moving in the direction we were already going. I know this answer is completely unsatisfying academically, but I believe that there are certain situations where you just have to run with a gut feeling and see how it turns out. If it had failed, we’d just be out of $1,000 or so. Seemed worth the risk.